The following recipe is featured in Fishwives – A Cookery Book by Goatsbridge on page 56 and was provided for our Charity book by Anna Eason. Anna got involved with the trout business when she married Ben Eason, the third generation of Sunburst Trout Farms in North Carolina, USA. She has a BS in Marketing and Information Systems from North Carolina Sate University and is Marketing and HR Director at Sunburst. She also runs the farm’s social media accounts and website. You will also find her behind the lens of a camera photographing products, as well as designing packaging for the evolving product line. Anna says her biggest accomplishment is being mom to three feisty girls, Taylor, Mollie and Emory! If you’re looking for inspiration on how to cook trout, there are many more recipes in the book that’s available from our online store. Whisk the orange juice and zest with the oil, lime juice, rosemary, garlic, salt, ginger and pepper. Mix until combined and set aside (this is your marinade). 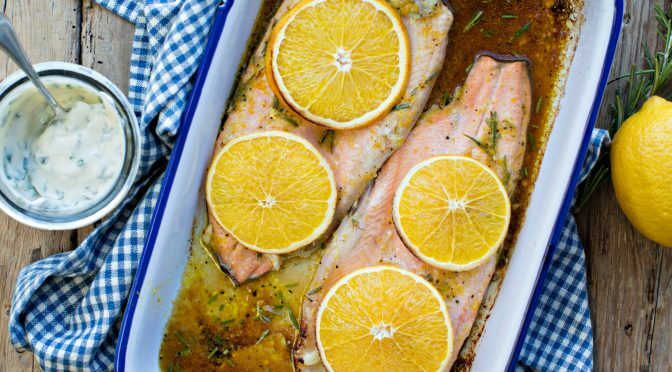 Place the trout in a baking dish, skin side down, and pour the marinade on top. Cover and refrigerate for one to two hours. Preheat the oven to 200ºC/400ºF/Gas Mark 6. Remove the fish from the marinade and transfer, skin-side-down, to a rimmed baking tray. Top with the orange slices and bake for 14 minutes or until the fish is cooked through. Garnish with the roasted orange slices. Serve with new potatoes and your favourite salad.